Kintaro (a.k.a. "Golden Boy"), a popular child folk hero embodying strength and bravery, appears in statues, storybooks, anime, manga, noh, kabuki and candy. He was also the subject of numerous Edo-period woodblock prints. Various legends say that Kintaro was raised by a Yamamba ogress in the mountains, where he learned to communicate with animals. 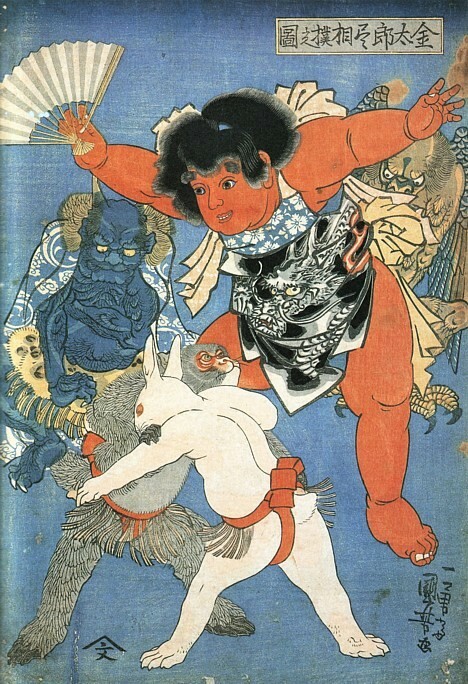 In this Kuniyoshi print, Kintaro wears a dragon haramaki and referees a sumo match between a rabbit and a monkey, while an eerie blue demon and tengu look on. As a youngster, Kintaro developed superhuman strength that enabled him to crush boulders, fight monsters and demons, uproot trees, and defeat bears at sumo. 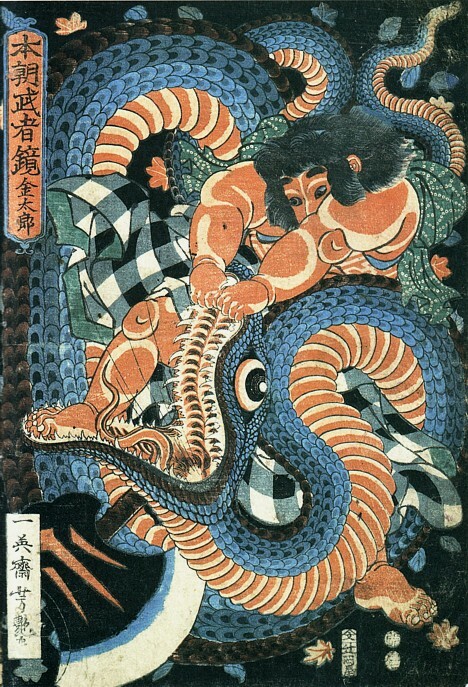 In this Yoshitsuya print, Kintaro demonstrates his unparalleled fighting skills by overpowering a giant python. His trademark axe is pictured at the bottom. The next series of prints, also by Yoshitsuya, show Kintaro with monsters and animals at various times of the year. Kintaro appears to be based on a real person named Sakata no Kintoki, a powerful Heian-period (794 to 1185 AD) warrior whose legendary status has grown with time. 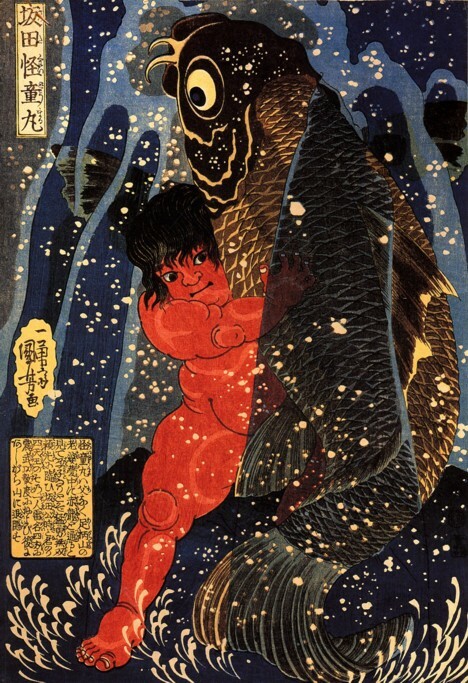 This Kuniyoshi print shows the young warrior wrestling a giant carp under a waterfall. 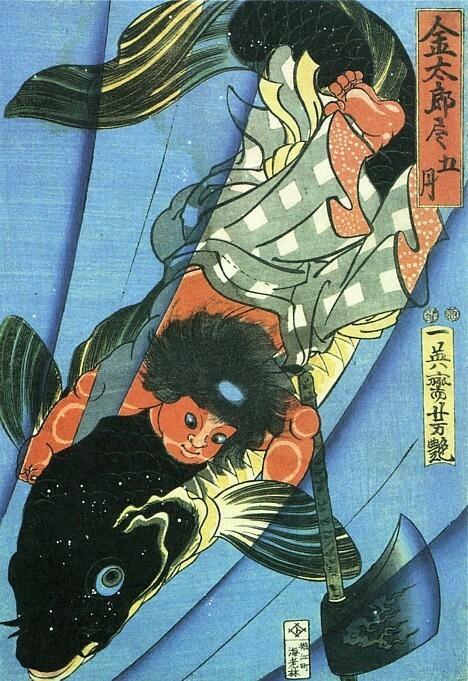 Kintaro is closely associated with Children's Day (May 5), when parents of young boys typically display Kintaro dolls -- usually riding a large carp -- in the hope that their kids grow up to be brave and strong. These are beautiful, especially the ones of Kintaro with carp. Thanks! 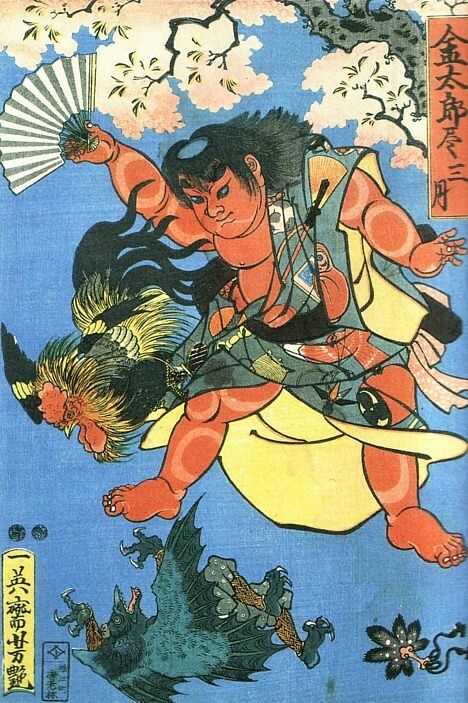 It looks to me as if Kintaro is portrayed with a water-filled dent on his head, as if he was some kind of kappa, in the prints by Yoshitsuya. 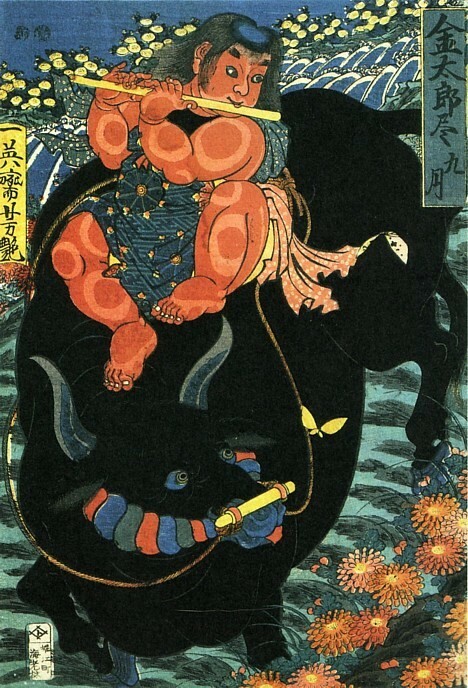 And, in the first print by Kuniyoshi, there seems to be a blue spot visible on top of his head as well. Does anyone know if a "kappa dent" is a feature of Kintaro in any of the Japanese legends about him? That rabbit reminds me of Okamura from 99. OOOPPPS sorry try this one. 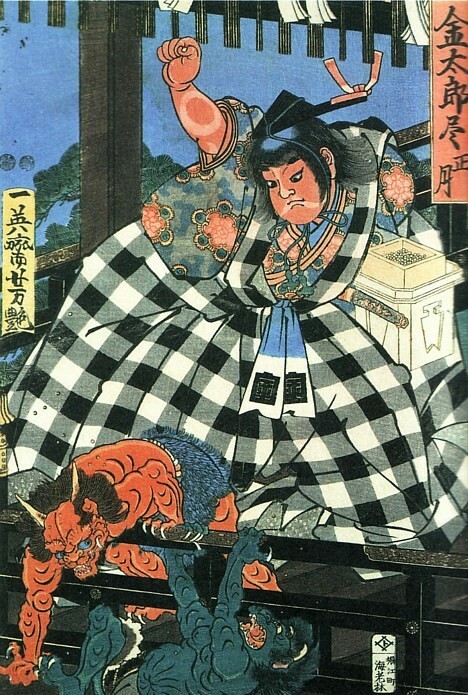 How much would a copy be of Kentaro Refreeing the Demon and Rabbit? C-MONSTER.net. » Blog Archive » The Digest. 05.02.08.